Model SX1A0-PCLS-01 single phase integrated type keypad meter adopts large scale integrated circuit, digital sampling & processing technology and SMT manufacturing process. It is designed and made according to users' actual energy consumption. 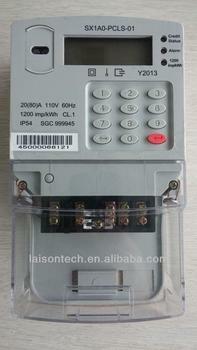 The performance of above mentioned meter conform with IEC62053-21:2003 Alternating Current Static Watt-Hour Meters for Active Energy (classes 1 and 2) and IEC62056-21; Model SX1A0-PCLS-01 single phase integrated type keypad meter conform with the standards of STS. The meter can measure current total active energy, current balance, instantaneous voltage, instantaneous current, instantaneous power and has the function of STS prepayment, LCD display, event record, opto-electrical communication, acousto-optic alarm, relay control, etc. It has stable performance, high accuracy and easy to operate. Model SX1A0-PCLS-01 single phase integrated type keypad meter consists of measure unit, data process unit and opto-electrical communication unit. It can display, store and transfer data besides measuring active energy. During meter's work period, after sampling respectively by sampling circuit, voltage and current will be sent to the MCU which has SOC to analyze and process and then realize the function of measuring energy and display,store and transer.The microcontroller shown in the figure can control LCD, relay, LED and buzzer and make alarm according to the preset power threshhold and balance alarm. It can transfer the data and event log to the external PC devices by opto-electrical communication.